Allegra Boverman/Gloucester Daily Times. 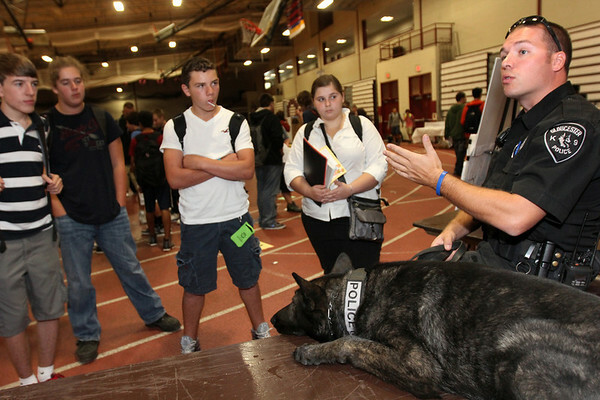 K-9 officer Chris Genovese and his K-9 Mako, both at right, talks about the work Mako does for the police department as his partner during a health and heathcare career day at Gloucester High School on Wednesday. Gloucester High School Health Center and Addison Gilbert Hospital hosted the free health fair and healthcare career day. Listening from left are: freshmen Stephen Barusso, Ryder Enos, Chris Cassettari and sophomore Susan Martin. Genovese and Mako also demonstrated some of the kinds of skills they work on together earlier in the fair.